Words cannot express the sadness with which this message is posted. Mrs. Paula Gibson, fondly known as Auntie Paula, died early this morning following a brave fight against cancer. She is sorely missed and much loved. She was very kind and generous to many,. many people. She never forgot me or my nephew when he was little, my friend's children when they were small and she loved my boys Fionnegan, Gunnarr and Shorty. And she was a great baker. No one can bake an apple pie or blueberry muffins like she did. I'll never be able to eat either one without thinking about her. But her true generosity became most evident when I served in Yap with the Peace Corps. Shortly after arriving I mentioned I saw a little boy with mismatched flipflops. Next thing I knew there were 25 boxes of brand new shoes, clothes and school supplies for children. What should I do? I stopped at St. Mary's Church and gave them all to Father Kelly! He distributed them to schools in nearby villages and Ulithi. She sent more gifts and supplies for the school children and many of those boxes made it to Fais for Christmas. When refugees from India and Nepal landed in Yap, there was a great need for food and supplies. Mrs. Gibson to the rescue. She sent many more boxes packed to the limit with brand new shirts and food and personal hygiene supplies. I told the hospital administrators that the best thing that happened to Yap during my Peace Corps service was Mrs. Gibson. She had sent food for the dogs of Yap - my Chocolate and Shorty among others. And she even kept sending supplies for Shorty (before he was brought home to me here in Boston) even after I returned home! Whenever I went to visit her in the hospital I was totally impressed at the devotion the nursing staff had towards her. She said she always took the time to learn the names of the nurses and staff and a little something about each one. A lesson for each of us. My own clinical medical health assistants and office staff loved her. She was just one of those people that you notice, and one that always impresses you in a very positive way. She makes a good first impression. And she loved to talk. She could talk your ears off! I am humbled to have known her and to have been a part of her life, especially during such a challenging and difficult diagnosis. There are many stories I can share about her, and perhaps they will be sprinkled in blogs to come. But I am going to end this tribute now. May God bring her home to Him. May she be in Heaven 30 minutes before the devil knows she is dead (an old Irish saying). And may she keep an eye on us as we do our best to help others. Rest in Peace, Auntie Paula, rest in peace. 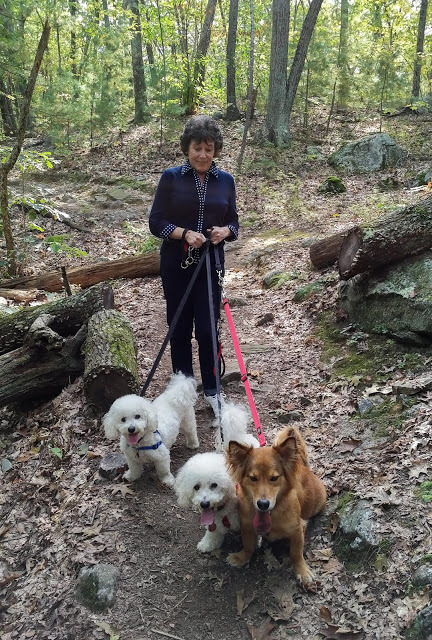 Here she is with Fionnegan, Gunnarr and Shorty as we took a walk in a local forest. Pale pink roses were her favorite. This one is for her remembrance. On my visit back to the old southwestern Pennsylvania homestead, we visited Kentuck Knob, a beautiful home designed by Frank Lloyd Wright in 1953-1956. The home blends into the natural environment and is a peaceful respite on a hot summer day. It is simple in design and blends into the contours of the land. It is build in a crescent shape with hexagonal corners and no 90 degree angles, it has limited space for clutter or storage. It allows one to focus on the woods which now surrounds the home and the property overlooks the Youghiogheny River gorge. Kentuck Knob is not far from the magnificent Fallingwater, perhaps one of his most famous homes, that yes, includes a waterfall in the design. Fallingwater is maintained by the Western Pennsylvania Conservancy, an organization that has managed to save many wilderness areas, wildlife and plants in the area. I have been a member of this organization for many, many years. Back view of the home. The bedrooms face this side and there is a small waterfall and pond on the right under the window of the master bedroom.. The front side of the house. This detailed pattern is carried around the house. It is open here, screens are in place in the living areas so these "windows" can be open. This side of the house looks over some gardens and the woods. Look at the skylight design. There is a Buddha in the living room. No pictures were allowed inside the home, so this is taken from the deck. There is also a sculpture garden. Birdhouses at the main visitor center. This is the Pennsylvania of my youth! Beautiful rolling hills, our Blueridge Mountains, farm lands, and forests comprise most of the scenery of this part of the state. This is the view taken from the path at the back of Kentuck Knob. The journey took us along back roads where we came upon this old Whig Church, built in 1901 and still in use. Looks much like it did on 1901. An old cemetery is behind the church with graves from the early 1800's as well as contemporary times. Here lies one true Pittsburgh Steeler fan. Yes, football in this part of the country is in our blood, our water and our DNA. Now also on a headstone! Gone a long time ago, but not forgotten. This soldier fought in the French and Indian War. Fort Necessity is also just down the road from here. There also is a lot of history in these hills! This was a nice journey back to my roots in Southwestern Pennsylvania. A lot of natural beauty, history important to the early days of America, many rolling hills and flowing rivers and waterfalls, and excellent utilization of this beauty in the special architecture of some very special homes. It was a lovely return to a very special place. One of my favorite places ever is Ohiopyle Falls in Pennsylvania. I grew up not too far from this scenic area in the Laurel Highlands and spent many good times hiking along the trails and wading in the river. Even went rafting down the Youghiogheny River a few years back. It is as beautiful today as it was in my memory. For the outdoor enthusiasts, there is a very long bike trail along the old railroad tracks. There is swimming in a protected area of the river a bit before the falls, many rafting trips available, and a chance to enjoy some fresh air and hear the water roar as it travels over the falls. The Western Pennsylvania Conservancy has made great strides in protecting the wilderness and special properties to preserve plants and animals and scenic areas. In a kayak one can only get so close to the falls due to the force of the water pushing you backwards. He had already flipped over once. Swimming in the Youghiogheny River. Family oriented. The old railroad tracks over head that is now a bike trail that extends for 71 miles. A good workout for anyone! Pretty purple cone flowers attract both butterflies and bees. Butterfly weed with a bee. Two butterflies hard at work. A long view of the falls. Can you appreciate the natural beauty of the area? A good reason to be careful when river swimming or wading - unpredictable holes in the rocks. There are caution signs everywhere, with areas posted. Sometimes it is just too tempting to fish from a solitary rock in the middle of the river. Relaxing in the shade of the trees. No trip to Ohiopyle would be complete without a trip to the old Falls Market general store. Great ice cream cones! Watch and listen to the water.